A Very Scary Wing Chun Halloween! 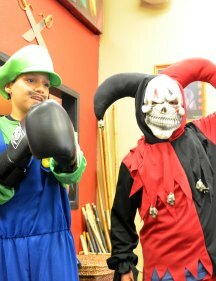 Nothing Beats a Wing Chun Halloween Party! 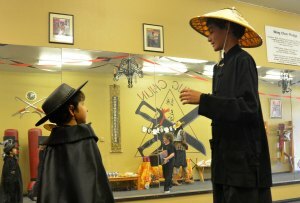 They turned the kids class into a Wing Chun Halloween party! And it was a hit. 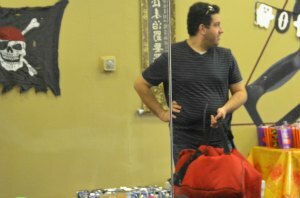 This Wing Chun school in Los Angeles put on a great event. All the students in the kids class came dressed in their costumes, ate yummy food, got candy, played spooky games, and had a great time (so did the parents). This was just a few of the remaining kids who stayed after class for a group picture. All the others bounced home with sugar highs. 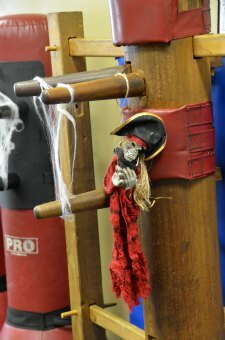 A hanging skeleton on a Wing Chun wooden dummy... oh, that's scary. Even the parents got into the fun. One dressed up as a pizza delivery man. No, wait, that IS the pizza delivery man. Kung Fu kids playing scary halloween games. Hold on! Why isn't anyone doing push-ups or the sil lum tao? That's a sifu pirate...? 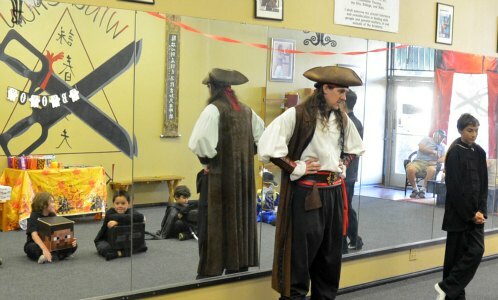 Let's try again... that is sifu Alon Peterson dressed as a pirate. Perfect costumes for a Wing Chun halloween. Zorro and Ip Man. Some more costumes of the night. 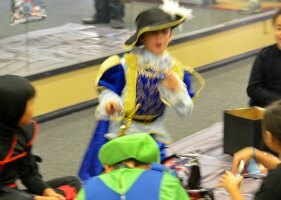 A Musketeer, a ninja, Luigi with boxing gloves, and some freaky thing that's going to give me bad nightmares. 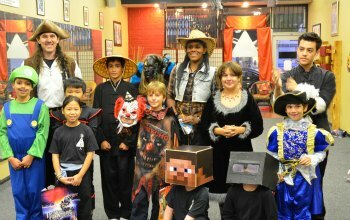 What did you do this Halloween to celebrate Wing Chun? Tell us all about it below. Your Turn! How do You Live Wing Chun? Tell us a little about it and spread the word around the world! You can even include a few photos and video links (The technical stuff is done behind the scenes). Enter video link or embed link here, too.